Pepe Romero, lecturer, classical guitar, is the second son of “The Royal Family of the Guitar,” The Romeros. His father, the legendary Celedonio Romero, was his only guitar teacher. His first professional appearance was in a shared concert with his father when Pepe was only seven years old. Mr. Romero is in demand for his solo recitals and performances with orchestra. His contributions to the field of classical guitar have inspired a number of distinguished composers to write works specifically for him, including Joaquín Rodrigo, Federico Moreno Torroba, Rev. Francisco de Madina, Lorenzo Palomo and Celedonio Romero. 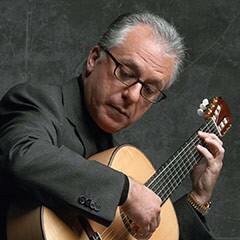 With his father and brothers, Pepe Romero helped establish The Romeros quartet as a leading classical guitar ensemble worldwide. As a member of The Romeros, he has been invited to play at the White House, has performed at the Vatican for Pope John Paul II, and has performed for His Royal Highness Prince Charles, Prince of Wales, King Juan Carlos I and Queen Sophía of Spain, and Queen Beatrice of Holland. As a soloist, Mr. Romero has appeared in the United States with the Philadelphia, Cleveland, Chicago, Houston, Pittsburgh, Boston, San Francisco and Dallas Symphony Orchestras, as well as the Orpheus Chamber Orchestra, the New York and Los Angeles Philharmonic Orchestras, the Boston Pops Orchestra and the London Symphony. He has been a special guest at the festivals of Salzburg, Israel, Schleswig-Holstein, Menuhin, Osaka, Granada, Istanbul, Ravinia, Garden State, Hollywood Bowl, Blossom, Wolf Trap and Saratoga. His Majesty King Juan Carlos I of Spain knighted Pepe Romero and his brothers, Celin and Angel, into the Order of “Isabel la Catolica.” The official ceremony of this high honor took place at the Thornton School on February 11, 2000, and included a gala performance by The Romeros with the Thornton Chamber Orchestra.